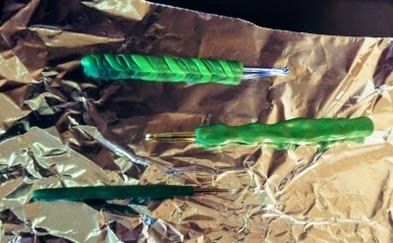 All of the polymer clay covered crochet hooks I created that afternoon. 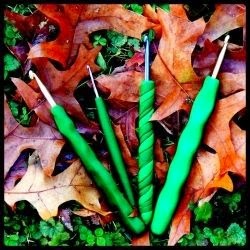 In this post I will demonstrate how to make a handle for any aluminum or steel crochet hook out of polymer clay. Sometimes crocheting with a standard hook can make your hands sore. Most hook holders I have seen really don't do much because they are really small or way too big and awkward. I have thought about buying new hooks with larger grips but I really don't have the money to replace my whole collection of aluminum hooks. 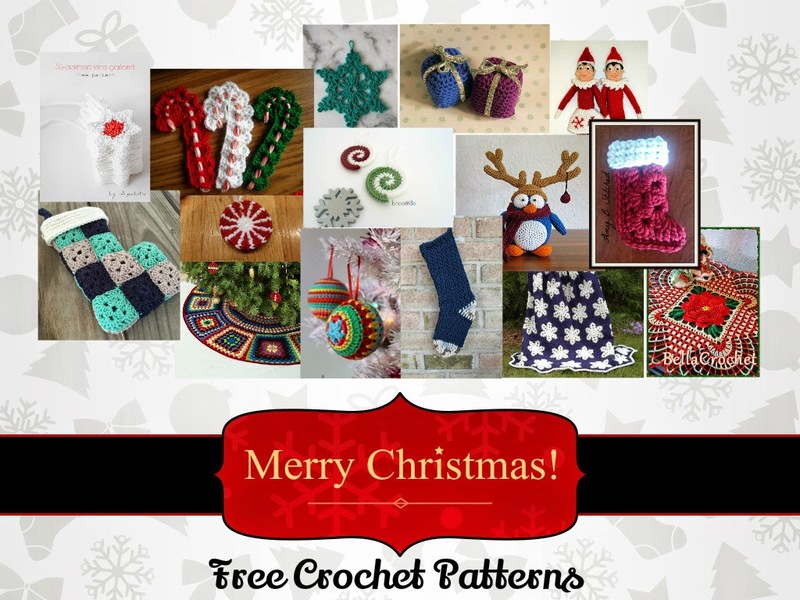 The only supplies you really need are an oven, polymer clay, and a steel crochet hook. Anything else you add to create your work of art is icing on the cake. In this tutorial I will also be using a stamp to for adding the size letter to the handle. I will also be using an old credit card to cut the clay. This produces a nice edge but is not necessary. This is the clay I used to create these hooks. 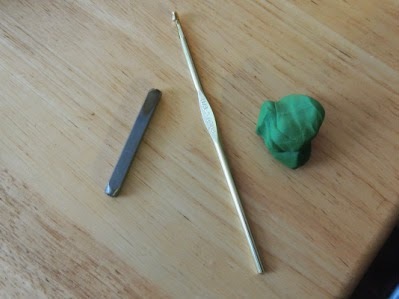 Start with your polymer clay and get it warmed up and easy to work with. When it is ready start forming it into a large cylinder. This will be the base of your handle. If you want if perfect and round take a lot of time in this stage to remove any dents or impurities from your tube. If you're like me and want to make some crazy design with curves that might not be 100% perfect, the tube below is a perfect starting place. 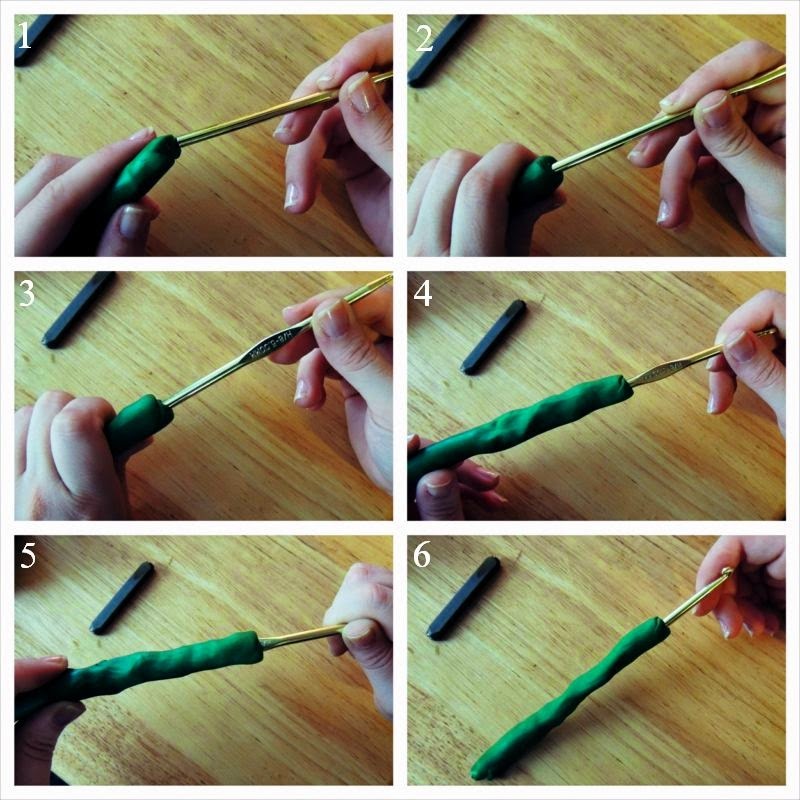 Work your crochet hook into the polymer clay. The process can be seen in the picture to the right. Insert the hook a little at a time make sure not to damage your cylinder. Also take care to keep the hook in the middle of the tube. 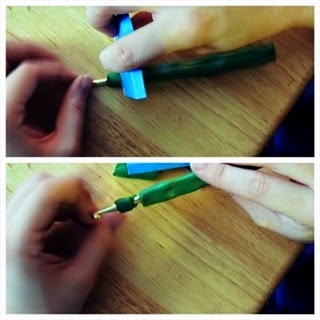 If you want your handle to be perfect and round take a lot of care not to squish the tube too much as to keep it round. 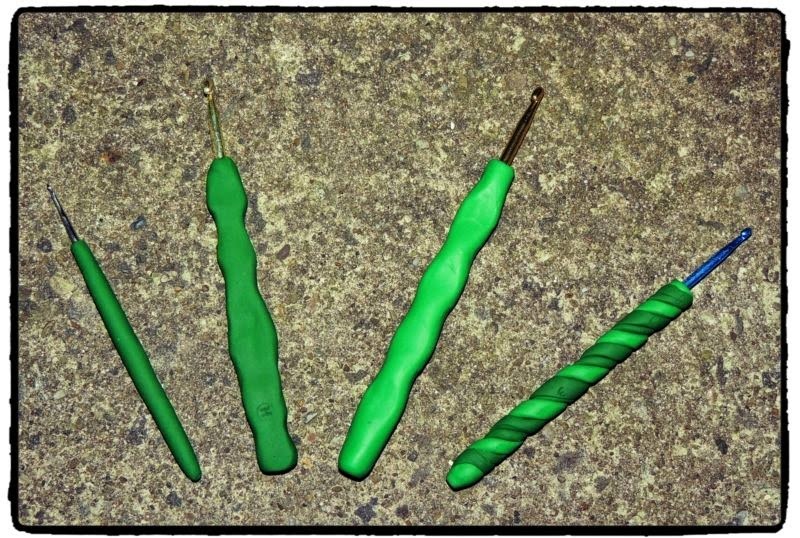 Keep working your polymer clay on your crochet hook until you are happy with the general shape you have achieved. Don't be afraid to add a little clay to your hook to fill in cracks and ridges. There are many ways you can mold your handle. You can keep the handle round and try to make it as perfect as possible of you can take your handle in a different direction. This is your custom handle so why not make designs that fit in your hand the nicest. Hold on to your crochet hook where you normally would while crocheting. Make indents that mimic your hands natural position. Work from there and mold the handle to your liking. Polymer clay is not like play dough. It blends and molds and blends like no other product I have worked. This allows beginners to make pretty interesting designs. Don't be discouraged if you can't get your handle to look right. Don't be afraid to start over. That is the magic of clay, nothing you create is permanent until you bake it. Use an old credit card or something of the like to trim up the edges along the top and the bottom of the hook. Once these areas are trimmed you can use your newly found molding skills to round these out or mold them to your liking. To trim the edges hold the credit card perpendicular to the crochet hook as shown in the top picture. Slowly rotate your hook 360 degrees while keeping parallel. Basically you will be rolling the hook to allow the card to cut the clay as clean as possible. This technique is also used to trim the excess from the end of the hook. 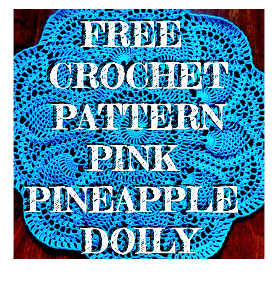 If you plan on labeling your crochet hook, this can be achieved one of two ways. You can use a small number or letter stamp to label the hook. If you don't have these stamps on hand you can also write into the clay with care using a toothpick. When you are happy with the shape of you handle. Place you hooks in a metal or glass pan on foil or whatever paper you use to bake with. The temperature of the oven is the most important. You will find this information on the clay you purchased. If you have an older stove I recommend using a oven thermometer to insure proper baking temperature. I added five minutes to the baking time that is listed on the packaging. These handles can be very thick and we want the to be baked as hard as possible. When your hook is done baking, leave it in the oven until it cools on it's own. If you have to make dinner soon, take the hooks out carefully and wrap them in a towel to ensure they cool slowly. If you don't cool them slowly they will be brittle and prone to breaking.